DUDE!!!! Those are sick! I found the actual site for where to order them but it’s in Chinese (I think). Anyone know how much it would be to have them shipped to CA? Are those Timberlands/hi-top hybrids? Oh jeebus. The french fry insoles are fantastic. WHAT THE HELL!? They better not be making ‘pizza shoes’ my awesome idea from when I was 8. Think vans or keds…painted with puffy paint to look like the game Pizza Party. Pepperoni, green pepper…occasionally some red onion. Sometimes the veggies have faces…I personally preferred making the pepperoni with a smiley face with its tongue sticking out. In fact, I’m gonna go make some new ones right now. @Clea – DUDE!!!!! 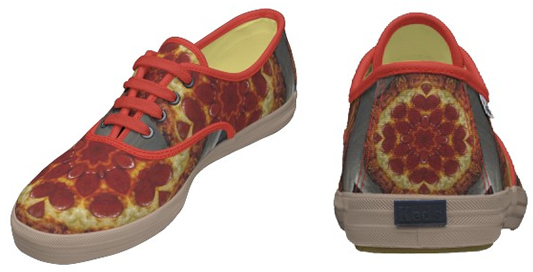 Pizza shoes is an AWESOME idea. I want them…now!